Our “Bye-Bye Bobby Bash,” the inspiration of reader Earthmother, was a huge success on Sunday (Jan. 10), just about 24 hours before Jindal leaves office as one of the most reviled governors in Louisiana history. Before getting down to our celebration, we observed a moment of silence in honor of the late C.B. Forgotston. Those of you who read LouisianaVoice regularly know that I quoted him often. He was an inspiration to me and he will be missed. He may not have been with us in body, but he was certainly with us in spirit. In attendance were Jerel Giarrusso (Earthmother) and husband Ted Hansen, Stephen Winham and wife Betty, several of our loyal readers, and our mystery cartoonist. Also on hand was Murphy Painter who was persecuted and prosecuted by the Jindal administration. It was LouisianaVoice and LouisianaVoice alone that said long before his federal criminal trial that Painter was not only innocent, but a target of reprisals by Jindal for Painter’s refusal to knuckle under to a major Jindal campaign contributor (Saints owner Tom Benson). Not a single news outlet, other than LouisianaVoice, peeled back the layers to look beneath the façade of lies and fabricated charges against Painter, to examine the real reasons for the administration’s actions. Painter was not only acquitted of all charges but the state then had to reimburse some $300,000 in legal fees incurred by Painter who, instead of taking his licks and walking away as the Jindalites apparently thought he would do, stood and fought for his honor and integrity. In the end, he prevailed. 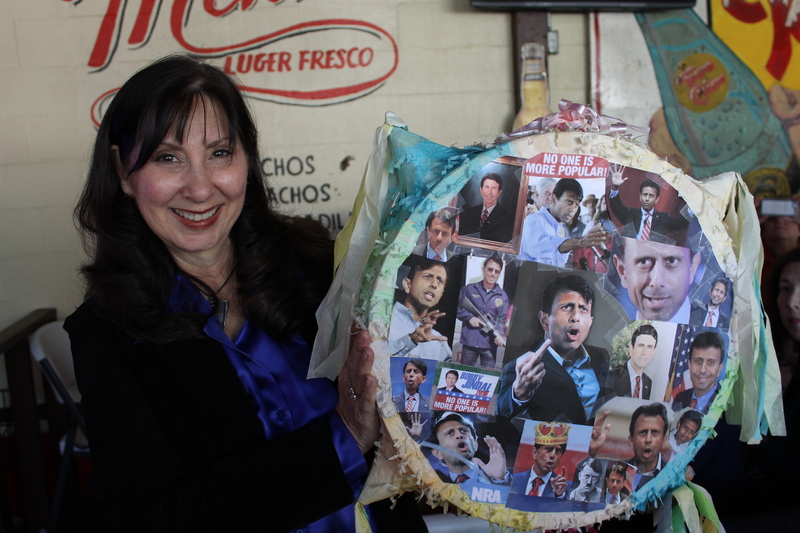 We handed out special party favors as a memento of the absurdity of Jindal’s tenure. I want to take this opportunity to offer a special word of deep appreciation to all who attended and to all my readers who were unable to attend. Without you, LouisianaVoice has no meaning. With your support, however, we managed to expose a lot of wrongdoing and even change a couple of things (the Edmonson amendment which attempted to sneak in a $50,000 increase in Edmonson’s retirement comes immediately to mind). With your continued support, we will continue to keep watch over the incoming administration and especially over the legislature which is no less responsible for our present fiscal mess than Jindal because it was those 144 men and women who enabled him. Below are a few photos taken at today’s event. Click on the photos to enlarge them. Somebody (Earthmother) brought a cake. Part of our diverse group. Jerel Giarrusso, aka Earthmother, made this inspirational piñata. Unfortunately, the proprietor of Superior Grill said his insurance policy would not allow us to actually break it, so we simply acted out our attacks for the camera. Earthmother got her pretend licks in. 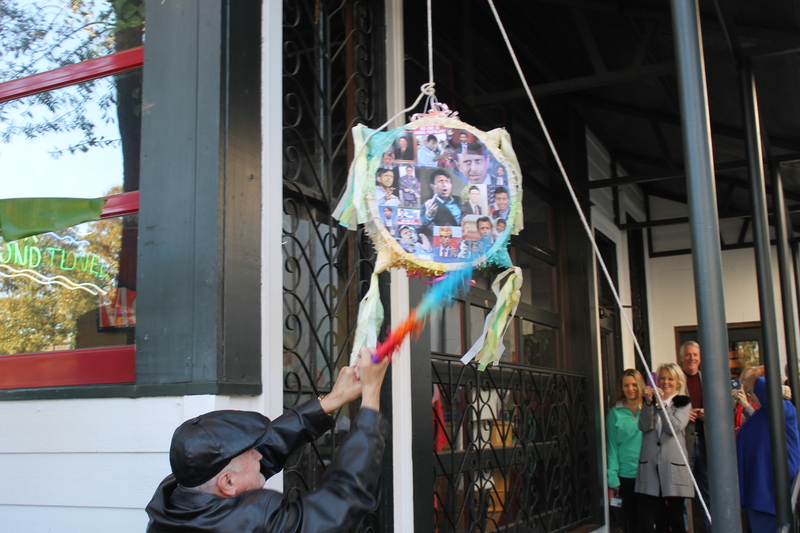 After what the Jindal administration did to him in its futile attempt at destroying his reputation and its unsuccessful prosecution of him, no one was more deserving of taking a whack at our Jindal piñata than Murphy Painter. Yours truly gets his turn. Thanks for hosting! It was cool getting to meet in person folks I’d only known on the interweb. And the party favors were awesome. Looks like a good time was had by all. I’m surprised to see the crowed was so old and so white. Hope your book finds a larger readership more diverse crossover. There were a few youngsters there and there were two African-Americans. The event was open to anyone who wished to attend–even Jindalites. I certainly enjoyed the afternoon!!! Please consider making this a semi-annual or annual event. It is an incredible opportunity to talk with like minded people. And we met some of our favorite commenters! I suggest we also be more active in soliciting the participation of other bloggers and their readers. And giving credit where it is due, it was Tom’s brilliant idea to have the event at Superior Grill. They didn’t charge for the room and were able to accommodate us when we didn’t know how many people would show up. We should all be alert to find other restaurants that might be able to accommodate even large groups. The mementos Tom passed out were business card sized folders with a picture of the Big J on the cover with “Pi-yush says…”. Inside, along with his exhortation to “Do More With Less” was a miniature condom. Oh, dang it! In addition to missing out on meeting some very interesting people, I also missed out on the coolest party favors ever! An injury and upcoming surgery has taken the wind out of my sails – for the time being. Sounds like y’all had fun! Didn’t know Tom was so bad! SRIRACHA – praying for good health and a speedy recovery for you. See you next time. 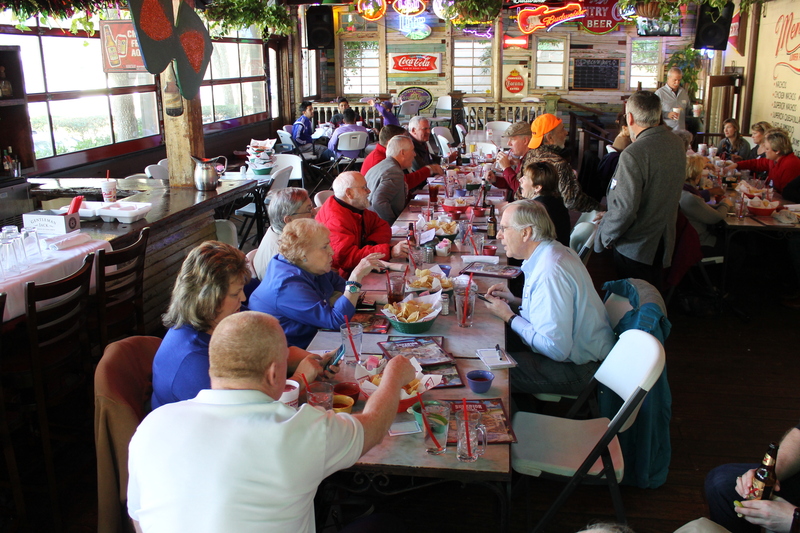 Such a delight to meet so many LouisianaVoice readers/commenters. Some of the best news is that Mystery Cartoonist WILL ride again. It’s very interesting that many of the attendees at the soiree occupy the grey hair demographic. We are mature but still ready to do battle when necessary. And it’s always necessary to keep watch, be aware, and unafraid to speak truth to power. And stupid. Thanks to Tom for arranging our gathering. His party favors were “the bomb” and an incredibly clever commentary after all these years of being exhorted to do more with less. In fact, it was that statement that drove me to the brink of revolution and cemented my decision to retire. Looking forward to seeing you all once again and meeting some of those who were unable to attend on Sunday.